Leonardo was keen on symbols and codes to get messages across, and he wanted us to know the identity of the model using the eyes, which he believed were the door to the soul and a means for communication. Invisible to the naked eye and painted in black on green-brown are the letters LV in her right pupil, obviously Leonardo's initials, but it is what is in her left pupil that is far more interesting. The other letters are B or S—although he points it could be C and E. These letters could offer the clue to finally find the real identity of the owner of mystifying smile, who has remained in a shroud of mystery for hundreds of years. Another secret hint discovered under the bridge in the background—under its right arch—is a minuscule number: Vinceti believes this is a 72 or L2. 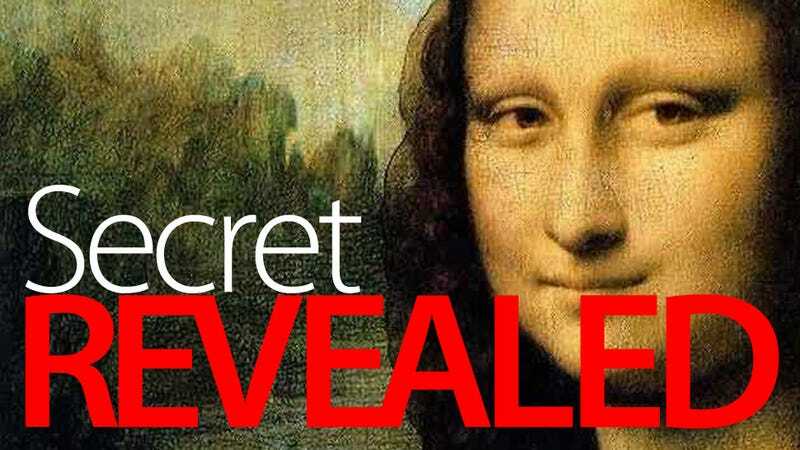 Some believe that the Mona Lisa was Lisa Gherardini, a woman married to a Florentine merchant. Vinceti says that this is not true, pointing to another clue in the painting: The number 149 plus an erased digit, which he says indicates Leonardo painted it in the 1490s, during his stay in Duke Ludovico Sforza's Milanese court.